Hello all! It's been a while since I have blogged about opportunities, but I'm trying to get better. I've been focusing a lot on my own writing, Black Fox Literary Magazine and my company, Writer's Atelier! It's been stressful, but very much worth it. I plan to keep blogging about opportunities, as I still believe in the mission. 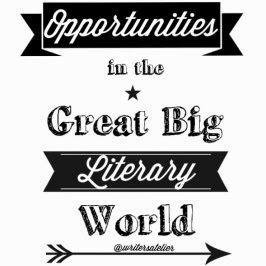 When I started this blog, I wanted writers to understand that there are tons of literary opportunities out there and while you're waiting on decisions for that novel (or even working on it), you can submit your work to various contests and magazines. It's good practice! Here are the latest opportunities. Don't be afraid. Get your work out there! 1. Gotham Writers' 91-Word Memoir Contest. Deadline: February 20, 2015. 2. Sable Books is accepting submissions for their 2015 February Chapbook Contest. Entry fee is $25. No solid deadline. Check their website for updates. 3. Iron Horse Literary Review is accepting submissions for their annual Single-Author Competition. This year, they are seeking to publish a prose chapbook composed of either stories or essays. Roxane Gay will judge. Entry fee: $15. Deadline: February 28th, 2015. 4. Cave Canem Poetry Prize: All unpublished, original collections of poems written in English by black writers of African descent who have not had a full-length book of poetry published by a professional press are eligible. (Authors of chapbooks and self-published books with a maximum print run of 500 may apply.) Entry fee is $15. Deadline: March 9, 2015. 5. The Moon City Poetry Award is for an original, full-length collection of poetry composed in English by a single or collaborative author. Entry fee is $25. Deadline is May 1, 2015. 6. The Southeast Review is accepting submissions for its 2015 contests in three categories: Narrative Nonfiction Contest, judged by Bob Shacochis; Gearhart Poetry Contest, judged by David Kirby; World's Best Short-Short Story Contest, judged by Robert Olen Butler. Entry fee is $16. Deadline: March 15, 2015. 1. Lunch Ticket is accepting submissions of fiction, flash fiction, poetry, writing for young people, & visual art for its summer/fall issue. 2. Canyon Voices is accepting fiction, nonfiction, poetry, art and scripts until March 1, 2015. 3. The New Sound: A Journal of Interdisciplinary Art & Literature is accepting submissions of short fiction, poetry, essays, drama, art and book reviews until May 1, 2015. 4. This Dark Matter, an online magazine devoted to dark fiction, is seeking fiction and poetry with an edge for the Black Friday Fiction feature. Submissions can include short stories, flash fiction, or poetry of any kind as long as there is some element of horror, wickedness, or mystery included. Submissions accepted on a rolling basis.